Old Car Memories > Muscle Cars > 1975 Pontiac Trans Am (L75) 455 H.O. – the King Returns? Automotive history as it has been written, 1975 will never be known as a banner year for muscle cars. The GTO, Chevelle SS, Challenger, and Cuda were among some of the most famous muscle car names to bite the dust by 1975. In 1975 the only Mopar muscle car names that remained (had become Chrysler Cordoba clones) – the Plymouth Road Runner and Dodge Charger, which had sadly become underpowered luxury barges with pillowy seats. Ford had completely given up, the Mustang by 1975 was know as the Mustang II and based on the Ford Pinto platform. Though it was a sales success it was as far from a muscle car as a car could venture. The availability of only 4 and 6 cylinder motors for the 1975 Mustang II, was a big reminder of this fact. The Torino had also grown to almost Thunderbird proportions however it still packed a V8 under the hood. Sadly the Torino’s largest displacement V8 was a 351 Cleveland that was very light on the horses. AMC was also out of the muscle car business by 1975. At GM things also looked grim. Oldsmobile still had a 442 and a Hurst/Olds and Buick still had a Gran Sport but these cars were so detuned, that their decals and emblems were the only similarity to their predecessors. Chevrolet also threw the white towel in the ring, by 1975 the largest displacement V8 in the Corvette was a 350 CID V8. The Camaro had dropped so far in performance and to add insult to injury, Chevrolet even dropped the Z28 from the Camaro lineup for a couple of years starting in 1975. Pontiac was also feeling the pinch like every other U.S. auto maker with the new EPA mandated emissions standards for 1975, lower compression motors that started in 1971 for GM (EPA mandated that all 1972 cars run on unleaded fuel, hence no more high compression motors), skyrocketing insurance rates, and the after effects of the 1973 OPEC oil embargo. Pontiac not one to give in to adversity, had beaten the odds up until 1975. The mandated lower compression engines had killed just about every high performance motor by 1972. Pontiac continued as if nothing happened and just converted to high performance low compression V8s. Pontiac high performance low compression V8 motors were so good that they could propel an almost 4,000 lbs Trans Am in the mid to high 13 second to low 14 second 1/4 mile time range. These motors were the 1971-1972 455 (CID) H.O. V8 (rated at 330 gross horsepower/300 net horsepower) and the 1973 and 1974 SD (Super Duty) 455 (CID) V8 (rated at 310 and 290 net horsepower respectively). As an example in 1973, Hot Rod Magazine test drove a factory stock SD 455 powered 1973 Trans Am and obtained a 1/4 mile time of 13.54 seconds at 104.29 mph. This was faster than most of the high compression muscle car motors from the muscle car golden era. Pontiac seemed to be leading no matter what the odds were up until 1975. It seemed the new for 1975 EPA emissions mandates which choked the engines with a single catalytic converter, EGR valve, and a maze of new vacuum hoses under the hood had finally put Pontiac’s back against the wall. 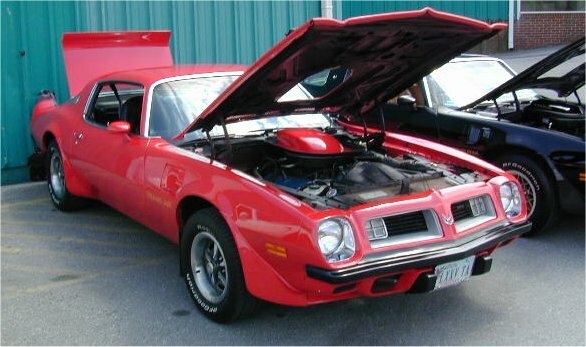 Pontiac announced in late 1974 that a L78 400 CID V8 would only power the 1975 Trans Am. This seemed like good news since the competition’s V8s were much smaller in displacement, but the 185 net horsepower rating of the L78 brought any muscle car fan back to the cold hard reality that things had changed drastically from the previous years. The good news was that the Trans Am by 1975 was skyrocketing in sales, even though the Trans Am was detuned it still was faster than it’s competition. And the buying public was taking note of this fact and voting with their dollars. Trans Am sales were skyrocketing for a reason. Even as muscle cars had waned in popularity the Trans Am provided fantastic handling and good performance all wrapped up in a stylish muscular shape. The 1975 Trans Am was a carry over from the successful 1974 Trans Am restyling. The only real changes in styling for 1975 were the front parking lights (which moved to the front grilles) and a new wrap-around rear window. Diehard Pontiac fans were still clamoring for more cubic inches, especially since Pontiac still made the Pontiac 455 V8, which was an option on the bigger Pontiac B-body, G-body, and A-body cars. Pontiac finally saw the error of their ways after the 1975 model year had started and decided to offer the L75 455 CID V8 from the bigger Pontiacs, which was rated at 200 horsepower. The good news was when the L75 was ordered the following were manditory: a limited slip 3.23 rear axle, a Borg Warner Super-T10 4-speed manual transmission, dual chrome twin splitter exhaust outlets, "low back pressure" muffler, and front sintered metallic brake pads. All of these items with the exception of the Super-T10 could not be ordered on any other ’75 Trans Am or Firebird. Since the L75 455 had come out of the bigger Pontiacs it came as no surprise that it produced plenty of low-end torque, 330 lbs/ft of torque at a very low 2,000 rpm. However due to the restrictive heads and a grandma type cam, the compression ratio was a very low 7.5:1. This meant a L75 Trans Am ran its best on 87 octane gas and began to run out of steam once it went beyond 3,500 rpm. Even with the L75 engine being a very low compression motor choked of power, performance was very good for 1975. Car and Driver Magazine obtained a 16.1 second 1/4 mile time at 88.8 mph which was almost a full second faster than the ’75 Trans Am L78 400 which took 16.8 seconds to make the same run. The 0-60 mph time of the ’75 L75 Trans Am was 7.8 seconds, which happened to be a full 2 seconds faster than the ’75 L78 400 powered Trans Am. Even though the L75’s performance figures paled in comparison to the figures of the previous years, The L75 Trans Am still beat the competition in performance. Even the lighter weight (than the Trans Am) 1975 Corvette could only obtain a 16.4 second 1/4 mile time and a 9.6 0-60 mph time making the Trans Am L75 the king of the streets for 1975. And if that was not enough for L75 Trans Am buyers back in 1975, it was very easy and cheap to almost double the horsepower with a few engine upgrades and bolt on parts, since what you had was a choked D-port 455 just begging for a hot cam, high performance heads, exhaust headers, etc. The 1975 L75 455 Trans Am was a wise move by Pontiac since it kept the Trans Am on top as performance king. This trend continued until the end of the 1979 model year when the last W72 400 powered Trans Ams left the assembly line. The mistake Pontiac made with the ’75 L75 Trans Am was marketing the package as the 455 H.O. All L75 equipped Trans Ams received the "455 H.O." decals on the shaker hood scoop, which allowed critics to take a cheap swipe at Pontiac. And rightly so, since the ’75 L75 Trans Am was at least 2 seconds slower in the 1/4 mile than the 1971 to 1972 Trans Am 455 H.O. The L75 option carried over to the 1976 Trans Am with the same mandatory limited slip 3.23 rear axle and 4-speed transmission. Pontiac did learn their lesson by 1976, the package had just a "455" decal on the shaker hood scoop. For 1975 only 847 L75 455 Trans Ams were produced mostly due to the late 1975 model year introduction. 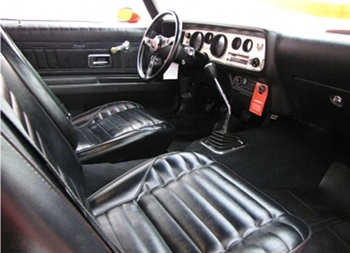 By 1976 the L75 Trans Am option was much more popular with sales being a little over 7,500 units. The 1975 Trans Am L75 455 kept the Trans Am on top in terms of performance for 1975 and kept the momentum going. And things kept getting better for the Trans Am as the 1970s progressed. For that alone the 1975 Trans Am L75 455 deserves recognition in the annuals of muscle car history. So in the final analysis the King did return after-all in 1975.